I am not quite sure where I first heard of the Uptown Girl comics. Can't even speculate. Here's what I do know: I requested the first collection of Uptown Girl comics, Begin the Begin through my library's interlibrary loan system and I've spent the last week delighting in this strip. 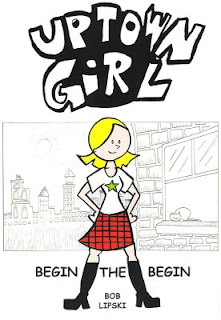 Uptown Girl was first published in Spring 2002 and is a monthly comic written and drawn by Bob Lipski. Set in Minneapolis (in the Uptown neighborhood, even), Uptown Girl tells the story of, well, Uptown Girl and her friends Ruby Tuesday and Rocketman. Uptown Girl is a reporter for City Pages, Ruby Tuesday an artist, and Rocketman...well, he's a very exciteable guy who is something of a professional slacker, but is quite loyal to his friends. Together they get through their days meeting new people, solving problems (like that of Jack and Diane), occasionally dispatching bad guys such as Bad Bad Leroy Brown or Mack the Knife. It's cute and simple, but a great deal of fun. Appropriate for just about all ages, though slightly older folks will get the obvious (yet still cleverly done) references. Begin the Begin covers the first twelve issues plus the first annual of the Uptown Girl series. I'll be requesting the subsequent volumes via ILL, but I think I want to buy the volumes myself. It's really quite good, and a locally drawn comic, which makes it all the cooler. I wish I discovered Uptown Girl before now.